I Have Surmised the Answers to Life! Now How Do I Put These Pants On? I recently posted a joke on my FaceBook wall that was a “You Know if You Are Bipolar If…” list. 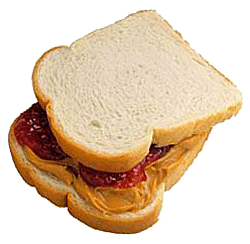 #1 on the list was about the mental illness “phenomenon” of going to sleep the night before, having figured out the answers to the universe only to wake the next day, debating as to what comes first on a PB&J…the jelly or the peanut butter! This “phenomenon” is well known to me, so I gave a good, hearty laugh when I first read #1. I have often found myself falling to sleep, excited about all the things I FINALLY figured out about life, geared up to put them into action the next day, only to wake wondering which foot first goes into my pants. Oh dear me…I am glad that I can laugh about that today. Anyhoo…while the referenced list was surely the author’s attempt to lighten an issue that is indeed quite serious, it also brings to mind how often I do, in fact, figure some things out for myself, in regards to suffering from General Anxiety Disorder, Bipolar II Disorder, or Borderline Personality Disorder, only to have the those answers become unviable or unattainable soon after having figured them out. In these instances, it is as though I physically have the answers in my hand, only to watch them slip through my fingers like grains of sand. I cannot express the feeling of defeat and disappointment that comes along with the loss of something that seemed to be the answer to what was so important. I realized tonight, that I am having one of those “Ah ha! The Answers to Life with MI” moments. No matter how much I desire to be a physical, meaningful, necessary part of some peoples’ lives, I never will be because I cannot make people see, that for all my faults, I am a pretty wonderful person to know and love. Friends and family will, and have lost out but what matters most is that in this instance, I know I am pretty great. This entry was tagged depression, mental health, mental illness, support system. Bookmark the permalink. 🙂 It’s a great place to start.